KIEV, Ukraine -- A second regional council in Ukraine on Thursday approved a government draft for a $10 billion shale gas production-sharing agreement with U.S. energy major Chevron, clearing the way for it to be signed. Deputies in Lviv region voted by 66-to-3 in favor of the draft, which calls for shale exploration in the Olesska field in the west of the country. A council in the neighboring Ivano-Frankivsk region, whose approval was also necessary, backed the deal last month. 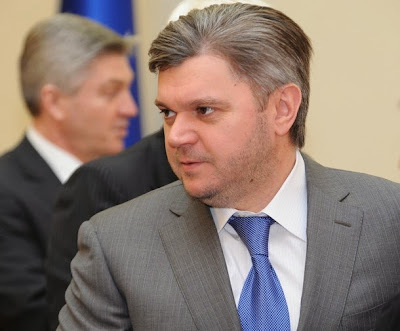 "Now we will submit the documents to the Cabinet of Ministers and then there will be the signature," Energy and Fuel Minister Eduard Stavytskiy told Reuters by telephone from Lviv. The Olesska deal with Chevron will be the second shale agreement in Ukraine, following one signed earlier this year with Royal Dutch Shell for exploration in Yuzivska in the east. Speaking to the council, Stavytskiy said on Thursday that Chevron would spend several years and $350 million to assess reserves at Olesska which covers 5,260 square kilometers. Deputies in both regions had expressed concern over the ecological consequences of the "fracking" process, in which water and chemicals are used to break up rock, sandstone and shale deposits to release gas. Stavytskiy says the two shale gas projects could provide Ukraine with an additional 11 to 16 billion cubic meters (bcm) of gas in five years' time. Gas production in Ukraine totals about 20 bcm, while the country of 46 million people consumes around 50 bcm every year. Ukraine imports gas from Russia at about $400 per 1,000 cubic meters. Ukraine has Europe’s fourth largest shale gas reserves, according to the U.S. Energy Information Administration, trailing Poland, France and Norway.